The Out of Water Project is both a traveling exhibition and a book scheduled to be published by Birkhauser Publishers in 2010. 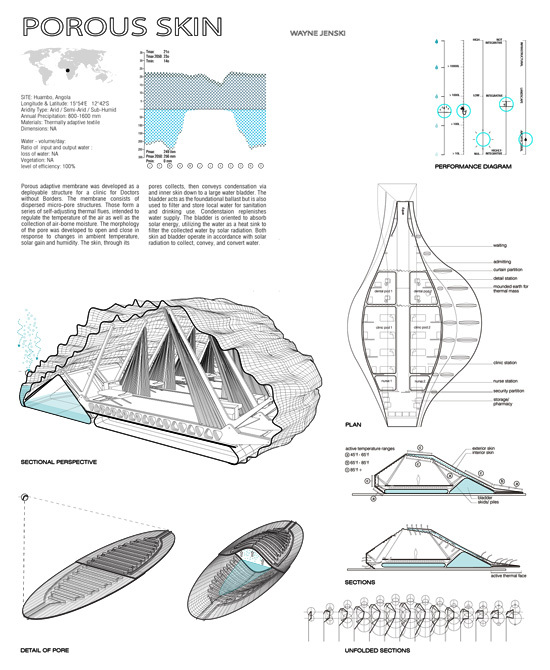 Organized by Liat Margolis, co-author of Living Systems, and Aziza Chaouni, of Bureau E.A.S.T., the exhibition currently features 24 international case studies of innovative projects and technologies for water scarcity on multiple scale, plus 10 Futures Scenarios designed by invited young designers such as Fletcher Studio, Proxy and MatSys. The book will be more comprehensive in scope and will include a set of self-generated mappings of global water scarcity, as well as an in-depth catalogue of cross-referenced case studies and future scenarios. The exhibition will travel to Ohio State University this Fall semester. 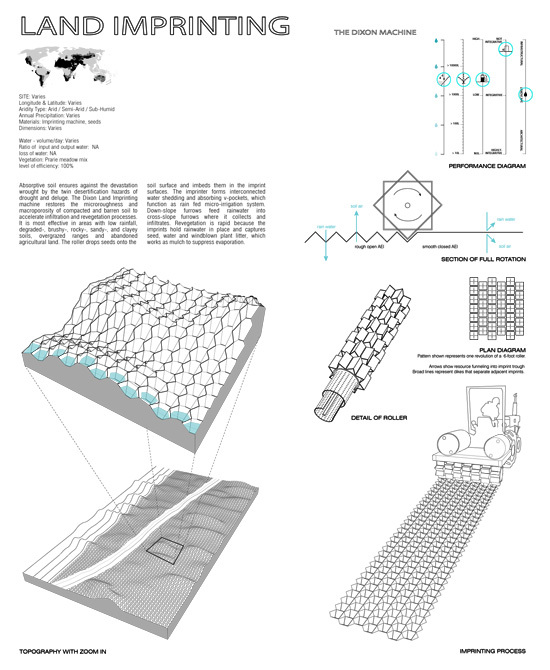 Previously, it was presented at the Daniels Faulty of Architecture, Landscape and Design, University of Toronto. Mason White, who is a faculty member there, posted some of the projects in his blog, InfraNet Lab. Below are some of the other projects, courtesy of Liat Margolis. One is Porous Skin by Wayne Jenski. Another documents an existing infrastructure for effluent reclamation in Israel. The main organization in charge of this is KKL (Keren Kayemet LeIsrael), or JNF in English (Jewish National Fund), which is the philantropic organization overseeing all aforestation projects in Israel for the last 50 years. In the last 20 years or so, they started building waste water recycling infrastructure for agricultural irrigation. 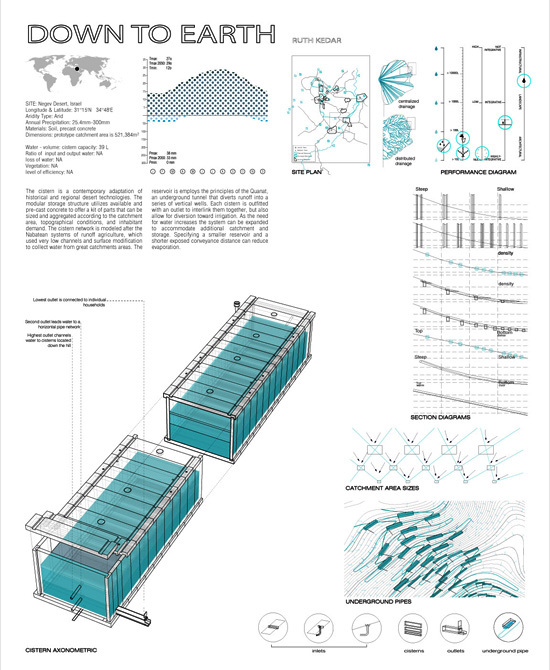 Next is a network of water storage units by Ruth Kedar. It is modeled after indigenous water management systems. Yet again quoting the project brief in full: “The cistern is a contemporary adaptation of historical and regional desert technologies. The modular storage structure utilizes available and pre-cast concrete to offer a kit of parts that can be sized and aggregated according to the catchment area, topographical conditions, and inhabitant demand. The cistern network is modeled after the Nabatean systems of runoff agriculture, which used very low channels and surface modification to collect water from great catchment areas. The reservoir employs the principles of the Qanat, an underground tunnel that diverts runoff into a series of vertical wells. Each cistern is outfitted with an outlet to interlink them together, but also allow for diversion toward irrigation. As the need for water increases, the system can be expanded to accommodate additional catchment and storage. Specifying a smaller reservoir and a shorter exposed conveyance distance can reduce evaporation. Last is the Dixon Land Imprinting Machine, which was covered by InfraNet Lab but it's so cool that we're going to replicate it here and enter it into our archives. We'll be pining for the rest of the projects, and if permitted, we'll post them here as they come in. We will certainly be posting updates on where and when the exhibition will be traveling to next. Keep a look out here for those.